By 1960 Walt Disney had already made a handful of Western's based on popular historical figures and novels and most of them had been very successful. It must have made perfect business sense to invest in more and this time Walt chose the journals of John Wesley Powel, the first man to travel down the Colorado River, as his source material. Unfortunately, the final result didn't reflect the spirit or financial success of his previous efforts. Walt hired William Beaudine to direct. He had worked for Disney several times before, directing episodes of The Mickey Mouse Club, Spin & Marty and one of Walt's previous Western films Westward Ho, the Wagons. John Beal, who had previously work for Disney as the voice of adult Jeremiah in So Dear to My Heart, was cast in the lead role as John Powel. Brian Keith (The Parent Trap) made his Disney debut in this film. David Stollery, famous amongst youngsters as Marty from Spin & Marty, was cast in his final film for Disney before stepping out of the Hollywood spotlight. Much of the film was shot on location in Utah, with some scenes obviously shot in a studio. Ten Who Dared was produced by James Algar, famous for his True-Life Adventures film series. While there are hardly any animals in the film, he most likely lent his expertise to the on location shooting. The plot of Ten Who Dared is pretty dull. A group of ten men, lead by Army Sergent John Wesley Powel, are attempting to travel down the Colorado River in search of gold. All of the men come from diverse backgrounds and are separated into boats. From the moment their journey begins, none of the men get along. More chaos ensues as they lose boats and encounter other challenges, such as a member of the party getting sick. The film ends with an epilogue about what happened to the men after they made it to the end of the river. Ten Who Dared was released on November 1st, 1960, and was instantly bashed by critics. They mostly blamed bad writing, but many jabbed at the unconvincing effects and unrealistic performances. Audiences responded similarly and Ten Who Dared was a box office failure. It was later aired on the Disney TV show. Many Disney fans claim Ten Who Dared to be the worst Disney movie ever made. Personally, I think that's too harsh. The company has certainly made worse films since, but it is probably the worst film made by Walt Disney, the man. For as hard to sit through as it is, it has a few redeeming qualities. The best parts of the film are the scenes filmed on location. And while most of the performances are lackluster, Brian Keith shines in his Disney debut. 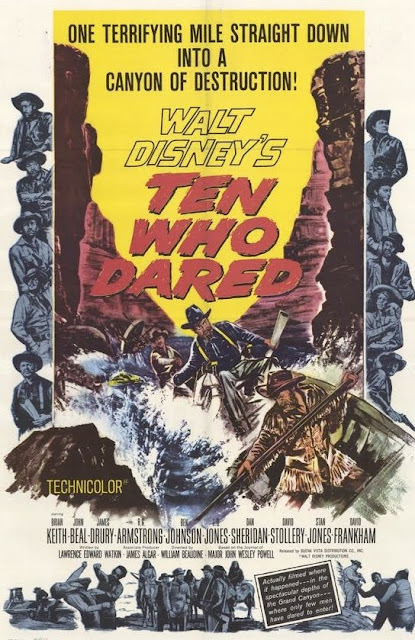 Ten Who Dared was released on DVD as a Disney Movie Club Exclusive in 2009. The DVD presents the film in fullscreen, most likely open matte versus pan and scan. The film was most likely released in matted widescreen, however we are lucky that Disney released it on DVD in the first place as it is sure to not be a top seller. The transfer appears to be the same one used on the VHS release in the 1980's and there are no bonus features. The film is also available on iTunes in fullscreen. You may watch the movie by merely clicking the play button provided online page on yesmovies. There's a complete world of those who actually enjoy the music, and that's more the world I come from. Click here to know more about Watch Full Thunderball Free - Fmovies.